Hi, I am interested in your 1951 Chevrolet 3100 (stock #1203-NSH) listed on Autotrader for $29,995. I'd like to get more information about this vehicle and confirm its availability. The technology in modern cars is amazing. They are faster, safer, and more comfortable than the old cars. Ahh, but the look of the old cars and trucks is awesome. Fortunately, there are people who enjoy, and are good at, bringing the two together in wonderful and creative ways. 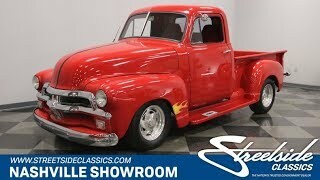 Like this 51 pickup for example. Check it out. The 3100 series pickups were the first series of redesigned Chevrolet trucks to go back into production after WWII. They were billed as longer, stronger and sleeker . Thats description seems quaint these days, but there is no doubt that their sleek lines look better than ever now. Use some of that modern technology to drop those lines down closer to the ground, coat them in a gorgeous shade of glossy Red paint, and tuck a set of Boyd Coddington alloy wheels under those distinctive fenders, and the truck definitely does look longer, stronger, and sleeker . Up front, the hood waterfalls down onto a double bar chrome grill that stretches from side to side underlined by a simple bumper that rides low to the ground. The split windshield reminds you what era this truck was born into as does the running boards between the fenders and the bed which is lined with wood, while discreet little touches like taillight built into the bed rails add to the custom look. Open the door and you will find a marvelous combination of old and new. The upright cab provides plenty of room and a large door for easy entry and exit. Open that door and you can use the bowtie plate on the running board to easily step up and into the modernized interior. Have a seat in the high back buckets that are comfortable and look great upholstered in red cloth trimmed with black piping. A black and chrome three-spoke steering wheel is mounted on a custom tilt steering column. Behind it is the original, old school dash board which looks fantastic in Red and Chrome with Classic Instruments providing the modern replacements for the original speedometer, tach, and engine gauges. An Alpine FM/CD and iPod compatible stereo with speakers mounted in the custom wooden center console is there for your listening pleasure, and that console also houses the shifter for the 3-speed automatic transmission while providing some convenient storage between the seats. Pop the hood and you will find a healthy 350 cubic inch V8 nestled down in a nicely detailed out engine bay. Based on a Corvette block, it was built up using forged pistons, a double roller chain, and Melling oil pump with the rotating assembly all balanced before setting the 64cc World Products cylinder heads with 1.6:1 roller rockers on. It is topped by a chrome Edelbrock air cleaner and Holley 4-barrel carburetor feeding a Performer RPM intake manifold. Long tube headers lead back to cherry bomb style mufflers. Chrome valve covers embossed with Chevrolet in script and a bowtie along with a chromed alternator add their splash of flash to the engine bay and an aluminum radiator with an electric fan keeps everything running cool. Coil springs and control arms up front work with power steering to make this truck handle nicely and power front disc brakes provide good stopping ability. The rubber meets the road through 225/70R15 tires on those gorgeous Boyds alloy wheels. One of the best-looking classic pickups of all time with the best of modern tech. Come on down and check it out. You might decide that this is the truck you have been looking for.